The world of timing devices including passive crystals and crystal based active oscillators has not seen a tidal wave change for multiple decades now. 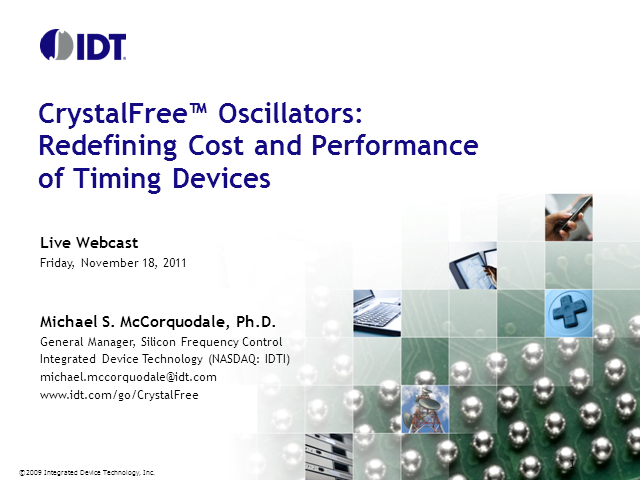 The introduction of IDT's CrystalFree Oscillators has redefined the cost and performance expectations of frequency control devices worldwide. This webcast will provide the viewers an introductory overview of the groundbreaking CrystalFree technology and the slew of benefits it will offer to customers worldwide. Live audience: If you would like to hear the audio from this presentation via the telephone, please see the list of numbers below this player.